Today it finally felt like spring. 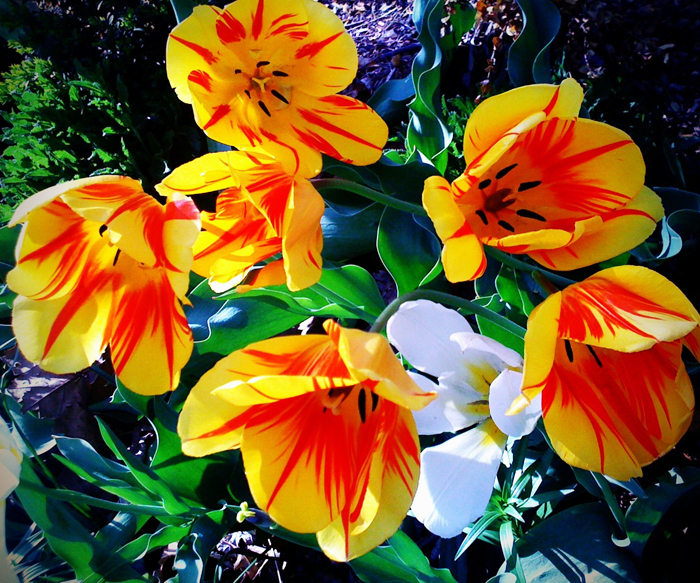 As I walked into the do-jong for Tae Kwon Do, the gorgeous Upperville tulips were blazing with color in the early evening sunshine. I thought I should take the opportunity to catch these flowers before they’re gone. You see, on Monday as I was driving through Upperville on the way home I saw a couple of young people in my friend’s yard. I had just passed Teresa on Route 50 heading into Middleburg, so I was surprised to see people at her house. As I slowly drove by (Upperville traffic calming at its best), I saw the young man pulling tulips out of her garden, yanking off the stems and throwing them back into her yard. Cameron, who had a better vantage point, noticed that his girlfriend clutched an entire bouquet in her hands. Yes, spring flowers are fleeting, but sometimes you just never know how quickly they’ll disappear.